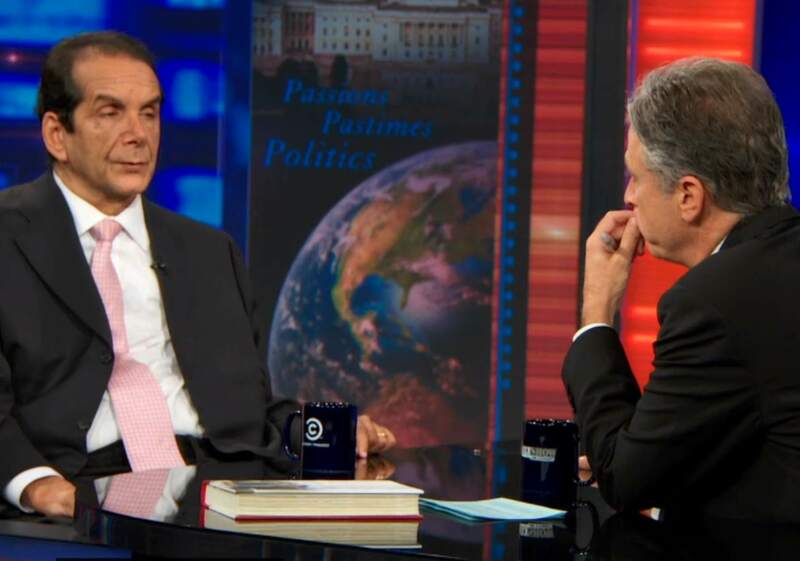 Take half an hour and enjoy this three-part interview, via RealClearPolitics and Comedy Central, of Charles Krauthammer by Jon Stewart on The Daily Show. Krauthammer was promoting his new book, Things That Matter: Three Decades of Passions, Pastimes and Politics–but he was also promoting conservatism, as he saw it, to a host and an audience familiar with conservative caricatures but rarely able to face the reality. Stewart deserves credit–not just for the interview, which was earnest and sincere, but also for understanding slightly more about conservatism than the average journalist (or comedian). In particular, what Stewart gets is that the Tea Party did not begin with Obama, and that Republican consultants in a pre-new media age used “anger points” in an effort to manipulate conservative voters, while growing big government when in power. What Stewart does not understand is that conservatism is not only a rational philosophy but an optimistic one. He also does not understand certain things about his own liberalism–how its theory clashes with its results, how its self-professed commitment to social responsibility is almost never observed in practice, how it is resistant to evidence and science when those facts clash with its own utopian thirst for greater control. Krauthammer does a good job of breaking through, though he misses an opportunity to present a stronger defense. Conservatism is not just concerned with fiscal reality, but with the philosophical challenge that the state presents to individual liberty. Opposition to Obamacare is not just based on fear of what a trillion-dollar entitlement will do to the national debt, but what cradle-to-grave statism will do to individual character. In addition, Krauthammer’s contention that conservatism accepts the New Deal is not entirely accurate–and it certainly does not accept the welfare state as a great “success.” In fact, conservatism sees much of the welfare state as a failure–and does so on the evidence. That was true of the criticism of the Great Society in the 1990s just as it was true of Reagan’s criticism of the New Deal in the 1960s, which set the stage for his presidency. Politically, yes–conservatism accepts much of the New Deal as an institutional reality, one to be reformed and improved rather than done away with entirely. But philosophically it is ambivalent, at best, about that era and its “achievements.” That is where Stewart’s suspicions are, to some degree, well-founded. And Ted Cruz–or what he represents–is more important to today’s conservatism than Krauthammer was willing to admit. But Stewart is far off the mark in his beliefs about what motivates Cruz and the Tea Party, seeing them as a sort of Frankenstein monster that escaped the laboratory. From the perspective of this country’s Founders and the principles they established, it is contemporary left-liberalism that is the monstrosity–the application of a crude principle of leveling at the expense of liberty, which in the end creates neither equality nor freedom. Ultimately what Stewart resents about conservatism is that it is “too easy,” that it allows people to evade a moral burden that he believes we should all bear. That is a very telling description, because it reveals that it is liberalism, not conservatism, that sees society in grim terms and demands moral strictures on individual conscience. The response to that misconception must be more than a balance sheet. Still, worth the watch.